Building on the success of its contributions to the BG-operated Scarab Saffron project in the West Delta Deep Marine (WDDM) concession, INTEC Engineering is providing professional services for the BG-operated Simian/Sienna and Sapphire deepwater projects for continued development of the concession offshore Egypt. The West Delta Deep Marine concession, north of the Nile Delta in the Mediterranean Sea, is operated by Burullus Gas Company on behalf of the WDDM concession partners. The joint-venture company, Burullus Gas comprises Egyptian General Petroleum Corporation (EGPC), Egypt’s national oil company, BG-Egypt and Petronas. First hydrocarbons from Simian/Sienna wells in waters up to 1030 metres are planned for third quarter 2005, with pipelines from the fields tying into the new Scarab Saffron WDDM subsea system. Production from the Simian/ Sienna wells – located northeast of the Scarab Saffron Fields and 114 kilometres offshore Idku – will provide feedstock for the Egyptian Liquefied Natural Gas (ELNG) export. The plant is located at Idku. The Sapphire Field – located west of Scarab Saffron and 74 kilometres from the Nile Delta shoreline – is a separate development and is scheduled to tie-in to the West Delta Deep system in 2006. INTEC is providing a seamless transfer of expert technology from Scarab Saffron to an integrated management team for Simian/Sienna and Sapphire. Through increased integration of key personnel and hands-on engineering from concept selection through the delivery of hydrocarbons, INTEC is helping BG to create a metaphor for industry change. The result is a more flexible working team, providing rapid response and purposeful solutions for complex issues. INTEC, a member of the Burullus Gas Project Management Team (PMT) for the Simian/Sienna and Sapphire projects, is providing engineering expertise for a world-renowned project that will install deepwater seabed facilities feeding a large-diameter 70-mile, long-distance subsea tieback, setting a new industry record. The PMT provides an integrated team of BG and INTEC personnel working toward the same goal: on-time delivery of a state-of-the-art subsea production system within the scheduled budget. For the offshore facilities, the PMT will manage the Engineering, Procurement, Installation and Commissioning (EPIC) contract, awarded in May 2003, which includes all subsea components and the design, fabrication and installation of a new-build unmanned controls platform. INTEC, as part of its PMT scope of work and separate from the EPIC contract, also is performing detailed Flow Assurance of the entire system. 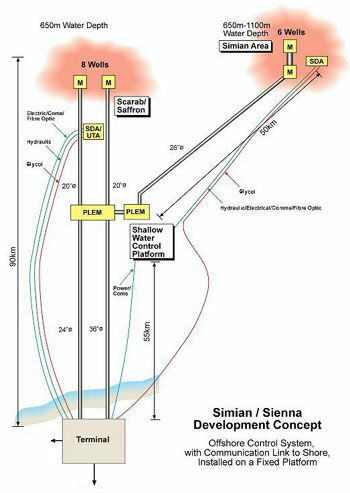 INTEC began conceptual selection on Simian/Sienna in July 2001, evaluating issues including controls, flow assurance, subsea hardware, pipelines and subsea architecture. In fall 2001, INTEC commenced Simian/Sienna front-end engineering design (FEED), which evaluated the above items in more depth while also developing the project schedule, a cost estimate, specifications and preparation of the EPIC bid packages for development of the Simian/Sienna and Sapphire Fields. The FEED work was completed in July 2002. As a member of the PMT, INTEC was charged with the technical tender evaluation of the EPIC contract. Thereafter, INTEC is responsible for Technical Assurance aspects for the Simian/Sienna project, including six subsea christmas trees, two subsea manifolds, one tie-in manifold, a 26- inch diameter export pipeline, a 20-inch diameter in-field pipeline, four 10-inch diameter flowlines from the trees to the manifolds, umbilicals, subsea control system, a four-inch diameter vent pipeline, a four-inch diameter glycol pipeline and controls platform. 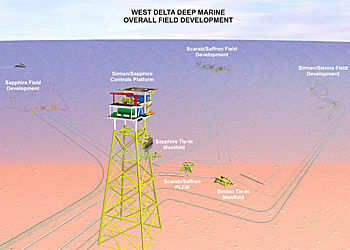 The Sapphire development has a similar deepwater subsea system, including eight subsea christmas trees. those best-suited to the project are recommended.